We are excited to announce that planning permission has now been passed to build our new community hall. This exciting project will produce a 2000 square foot hall space, bar area, kitchen and the possibility for the entire space to be partitioned into smaller conference rooms or additional classrooms. There will also be a two bedroom apartment above allowing our Priest to be onsite. We are in the process of completing external repair works to the front and roof of our Church, hoping to achieve this by February 2018. We have removed two old chimneys and repaired one, covered the outside meters, secured gas cylinders by building a suitable enclosure, fixed the central heating system, installed new security and sound systems, fitted new kitchen units and a burco water boiler. We have done further works to the Vicarage, stripped and re-rendered the complete external building, fitted a new front door, new bathroom fitted, new fences erected, cleared and tidied the garden. We have now paid off the mortgage in full for the Vicarage, paying over 80K in the last 8 years. We are proud to have over 80 children in our Greek School, a school which is heavily subsidized by our Church, allowing our young children to learn the Greek language and customs. We are pleased to welcome our new Head Teacher Matheus and are forever grateful to our team of Teachers, School Committee Members, PTA and Volunteers who have achieved so much over the years, ensuring our young children progress and flourish. I am really happy for being the head teacher of the Greek School of Brighton and to represent in Brighton the Cyprus Educational Mission that the last 49 years has one aim, to protect the cultural character of the Greek community in UK and to uplift the Greek spirit in our children. Even from my first visit to Brighton I have realised not only how well organised and successful the Greek School is but also the great quality of the people that is consisted of. My target is to ensure progress by keeping an open mind to new suggestions and to beneficial changes. In cooperation with the teachers and the school committee we have managed already to create a secure school environment, improve the teaching conditions and modernise the registration and data systems. On this point, I would like to thank my colleagues, the school committee and its chairman Nectario Makratzakis, Father Germano, the chairman of the church committee and member of the school committee Andrea Archontides who is always next to me and willing to help me with anything I might need and all the parents and children of the Greek School of Brighton for their very warm welcoming. I would like to wish to the Greek Community of Brighton, Happy 50th Anniversary and a prosperous year for our school. Sincerely, Matthaios Venetsanos, Head Teacher of the Greek school of Brighton . 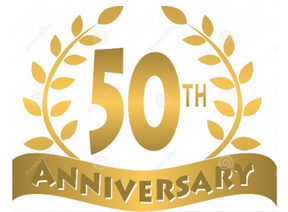 This year we celebrate our 50th anniversary of our Church and Greek School. “With particular joy and pleasure I extend my best wishes on the occasion of the 50 years anniversary of the Church of The holy Trinity in Brighton. I would like to congratulate all who have contributed their services over the 50 years, both those who have departed and those who are still with us today. All have worked hard and have contributed to the success of the community. You must all continue to work in a spirit of concord and enthusiasm under the guidance of your priest Archimandrite Germanos Kourkounis and your President Andreas Archontides and the church committee. This will allow you to fulfil purposes for which the community was founded. I am sure that you will soon be in a position to commence work on your building project for classrooms, accommodation for your priest and other ancillary uses. So to all of the above named, not forgetting their wives and families we must be thankful and grateful, for without their contribution and commitment we would not have our Church and flourishing Greek School that we now have.